I had some of the girls over for Christmas drinks the first Saturday in December and it was so much fun! Last year I had a larger gathering with both girls and boys, but this year I just didn’t have enough time or energy to prepare something big, but rather than not organising anything at all I preferred to scale it down. I do hope I have more time and energy last year for a proper Christmas party with lots of canapés, but I’m not making any promises. To start with we had prosecco (and quite a lot of it!) and savoury canapés, starting with warm crisps with browned butter, grated comté, lemon juice and cress. I love these so so much! I know it’s making crisps even unhealthier, but it is so worth it. I mentioned the browned butter right?! Thereafter I put out a little DIY project with crostinis. I had a large bag filled with crostinis and three jars on a silver tray with different spreads to put on top; bean spread with sage, hot smoked salmon spread (the girls favourite!) and a new version of chicken liver parfait (recipe to follow soon) and cornichons. After that I passed around a board of prosciutto parcels filled with cream cheese mixed with chopped sunblush tomatoes. It’s the easiest recipe ever (three ingredients!) but always goes down well. We then moved on to the hot food. 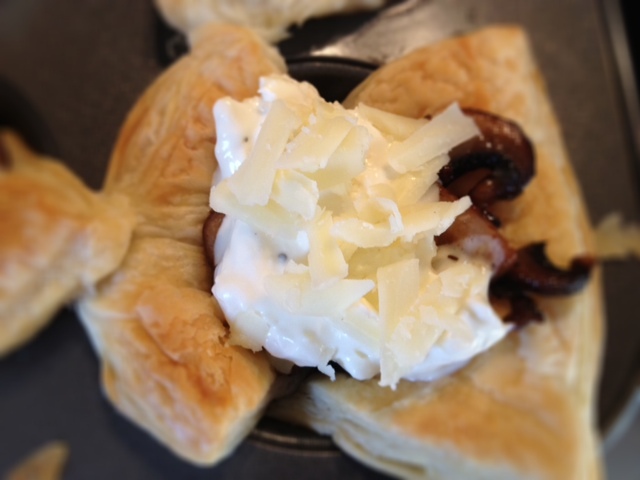 First up were these puff pastry squares with mushrooms, grated cheese, creme fraiche and parsley. Then the mini Janssons frestelse that all my London friends adore! Janssons frestelse is like a creamy potato bake (with grated potato) with anchovies. It sounds rather odd I know, but everyone who’s ever tried it loves it, I promise! Having finished the savoury canapés it was time for the sweets and glögg! I put it all out on the table at once to people cook pick and choose. The rocky road I made this year is probably the best one yet (recipe to follow), mainly because it has honeycomb in it and it really works!! I also tried to pretty them pieces up with snowflakes (which I tend to use on everything this time of year!) and edible glitter. I also served gingerbread with blue cheese, but this time I substituted Stilton for St Agur, which works even better. I also made these mini saffron pannacottas that I like to make every year – I’m so lucky my friends are happy to eat! 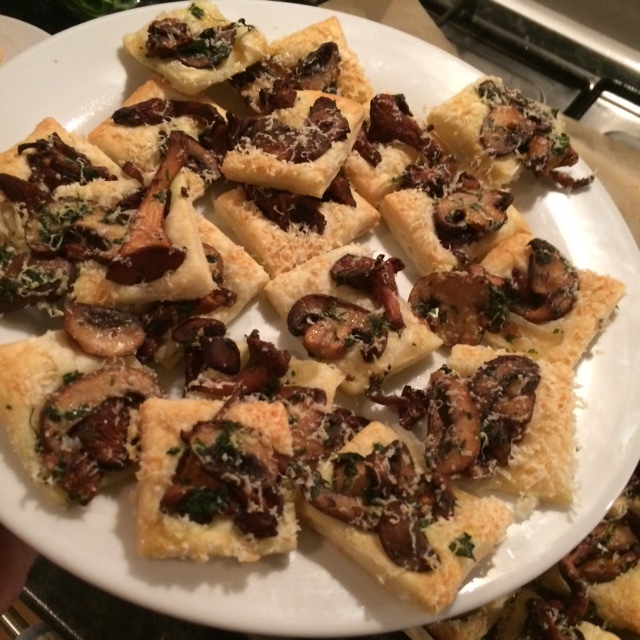 The third nibble for the party was these anchovies puff pastry rolls that everybody raved about. 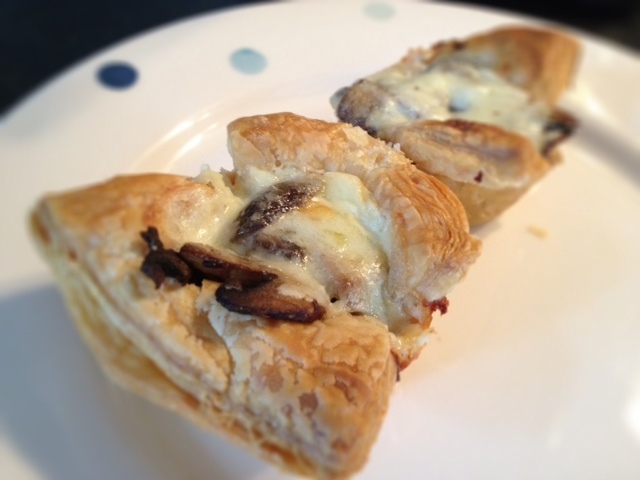 Thank goodness!, as I hadn’t tested the recipe beforehand.The whole reason I made these was to honour the host who is a serious anchovy lover. Luckily the others liked them too. The recipe is courtesy of Swedish chef Leila Lindholm, with a few changes; I used puff pastry instead of pizza dough to get a crispy flaky snack. And it really worked. Mix all the ingredients apart from the puff in a bowl. Roll out the pastry and spread a thick even layer of butter on top. Roll into a tight roll from the long edge and cut into 1 cm thick rolls. Place on parchment paper on a tray and bake for 200C until golden and crisp, approx 10 minutes. Serve immediately. These little quiches are far tastier than they look. They’re also super easy to make yet still tastes wonderful. And they’re so versatile. I had some for supper the other day with only some dressed rocket on the side. They would also work well at a brunch or picnic and can be served either warm or cold. Perfect when the weather is this unpredictable. Roll out the puff and cut it into six squares. Butter six holes in a muffin tin and cover with the puff squares. Prick the bottoms with a fork and pre-bake in a 180C oven for 10 minutes or until golden brown. In the meantime, slice the mushrooms. Melt a large knob of butter in a frying pan and add the pressed garlic. Add the mushrooms and fry until golden on medium-high heat, for about 10 minutes. Add salt and pepper. Mix the grated cheese with creme fraiche, salt and pepper. Divide the fried mushrooms between the pastry cases. Top with the cream fraiche mixture and scatter some more grated cheese on top. Bake for a further 10-15 minutes. Serve warm or cold. 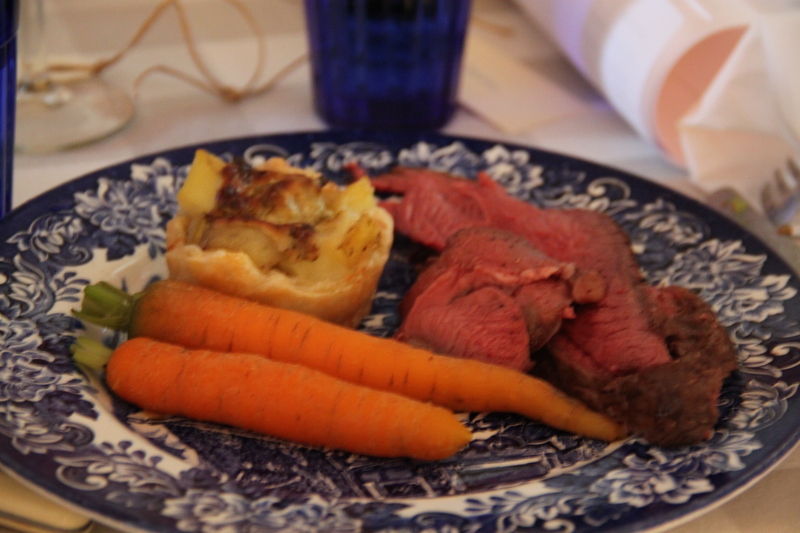 The main course at my birthday party consisted of two types of roast meat; beef and venison, puff pastry and potato parcels and a creamy Madeira sauce. The meat was simply prepared by trimming it, letting it reach room temperature, season and sear it all around in a hot pan and then transfer to the oven until pinkish red in the middle. Cover and let rest for 10 minutes and then slice finely. Served with a simple yet delicious Madeira sauce (reduce Madeira wine and beef stock with fried onions, then add cream and Maizena starch to thicken, season to taste) this was a wonderful meal. But what really made it come together were the puff pastry and new potato parcels with parmesan and parsley. So yummy! Roll out the puff pastry and divide it into six squares. Use a cupcake tin and place cover six of the holes with the puff pastry squares. Mix parmesan, creme fraiche and parsley in a bowl, season. Press as much of the potato you can into the buff pastry shells and top with a dollop of the parmesan mixture. Add some grated parmesan on top. Season and bake in 200C for about 20 minutes. Can be reheated. On Sunday a bunch of us were invited to Jess and Chris for a potluck lunch and some board games. A perfect Sunday activity! 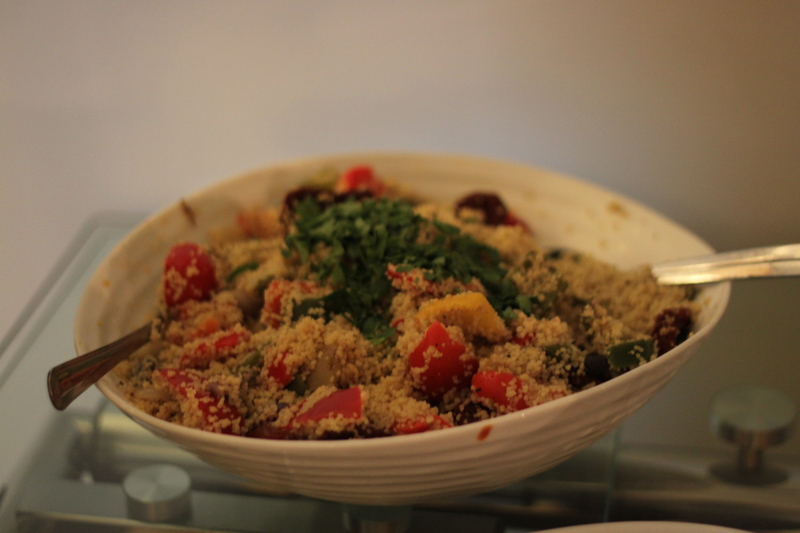 The hos and hostess had made a lovely coucous salad with feta and also contributed with nice breads. 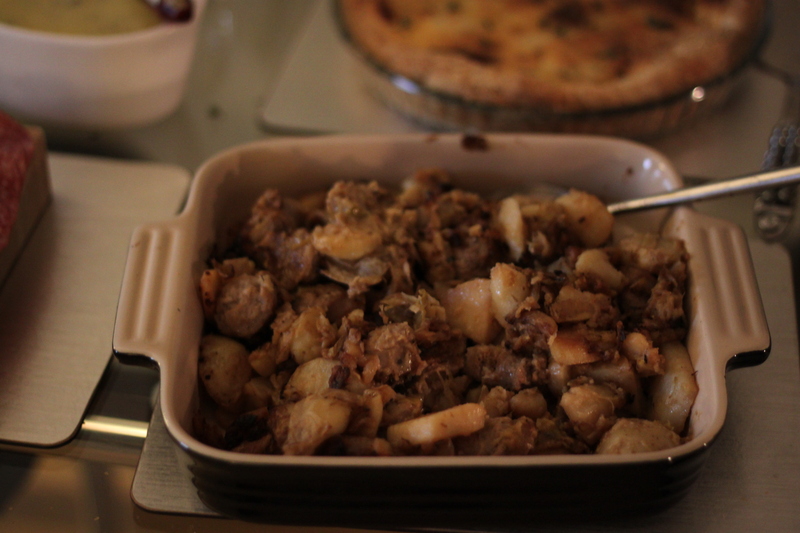 Ben had made a hearty casserole (more like a hash really) with potatioes, sausage and onions and Tom had made a chicken liver paté which was really nice. David and Debbie brought hams and salamis, and some brought wine. I contributed with marinaded pork fillet and a caramelized garlic tart I have had my eye on for quite a while. Jess had also made a dessert, that looked like a trifle but was brownies and meringues covered with cream and creme fraiche. Lovely! And Felicity made a gluten free crumble with a crunchy top. Yum! I must say it was a really good spread and such fun when everyone contributes! The tart I made is courtesy of Ottolenghi and it features (of course) in my favourite cookbook Plenty. It is easy to make as you use ready made puff pastry and it has apart from the obvious caramelized garlic also two types of goat’s cheese in it. I used a mild creamy one but instead of the hard goat’s cheese I used Ossau-Iraty, made of ewe’s milk instead. 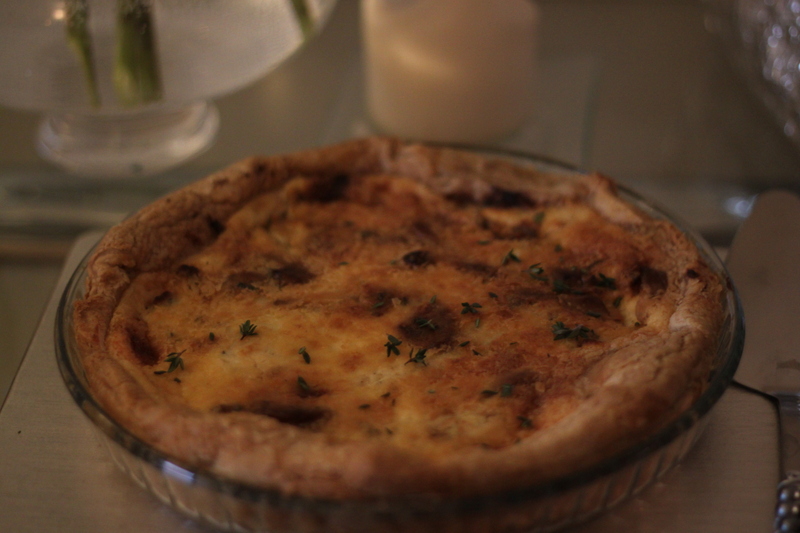 It worked really well, and the tart was exactly so good as I expected it to be. I will definitely make it again, and I think you should all try it too. It does not disappoint. Preheat the oven to 180C. Roll out the puff pastry and cover the bottom and sides of a quiche dish with it. Put parchment paper and ceramic beads on top and blind bake for 10 minutes. Remove and bake until golden brown for another 15 minutes or so. Turn the oven down to 160C. While the puff is baking, place the garlic in a saucepan and cover with water. Bring to the boil and let it simmer for 10 minutes. Drain and add the garlic back to the pan and add the olive oil too. Fry for about 2 minutes, then add the water and balsamic vinegar. Bring to the boil and cook for about 10 minutes, then add the sugar and herbs and cook for another 10 minutes or until the liquid is dark and syrupy. Assemble the tart by shredding the cheese into the pastry case, then add the garlic and the syrup and distribute. Combine eggs, cream and creme fraiche, salt and pepper and pour it into the pastry case. Bale for about 40 minutes in 160C or until the filling is set and the tart is golden brown. Serve warm or lukewarm. Reheats well.